Why do so many lecturers and public speakers use TV carts when giving important presentations? 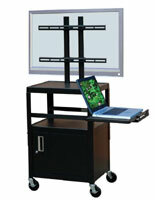 The portable flat screen trolleys provide both security and convenience to presenters using the latest technology. 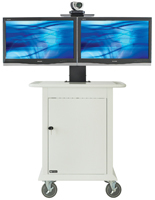 Monitor mounts with storage not only support large television screens, they also allow a variety of equipment to be safely stored between uses. 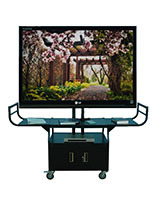 Portable TV carts with wheels offer plenty of room for transporting laptops, media players and other types of technology from one location to the next. 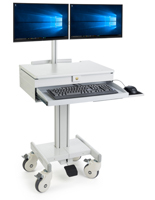 Our rolling metal stands with VESA compliant screen mounting brackets ensure that all of the necessary equipment is on hand at all times. 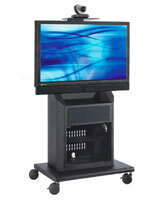 Flat screen TV carts with wheels, also referred to as audio visual trolleys, are available in different sizes and styles to accommodate the varied equipment used in multimedia presentations. 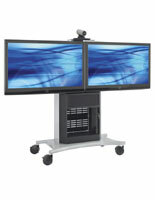 Audio visual trolleys used in conferences and training rooms need to both support the lecturing aids as well as coordinate with the décor. 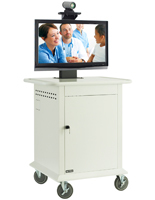 Our wheeled TV cart selection includes everything from simple steel racks with monitor mounts to elegant conference furniture with built-in equipment racks and stereo. 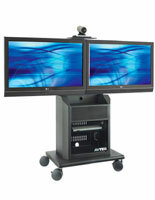 What types of establishments typically need audio visual trolleys for monitors and televisions? 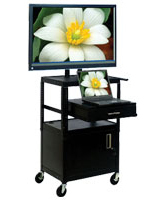 Mobile TV carts are designed for use in all sorts of speaking situations. Therefore the number of uses for flat screen television mounts is seemingly limitless. 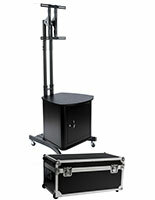 Training sessions, videoconferences, public speeches, business presentations, medical e-consulting and teaching are only a few of the many uses for this type of AV equipment stand. 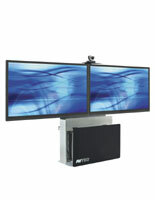 The monitor brackets with wheels are commonly found in offices and boardrooms. 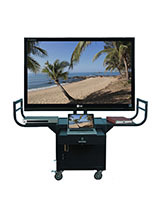 The mobile electronics displays can be used for training meetings, team-building exercises and sales pitches that require televised content. 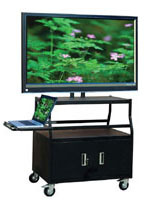 Churches, libraries, lecture halls, and other venues that use projector electronics opt for flat screen television mounts with wheels. 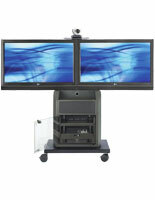 Interactive presentations are easy using the integrated camera/webcam shelf. 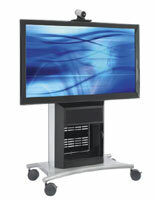 University classrooms and other educational settings are ideal for this type of audio visual furniture. 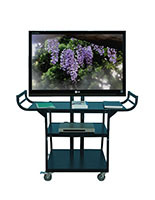 Professors and other educators frequently use AV trolleys to highlight outlines, share notes, or play video clips from the internet. No matter what kind of multimedia needs to be presented, one of these configurations is sure to provide a feasible solution. 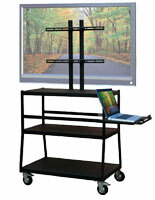 Many carts incorporate adjustable shelving and leaves to keep the electronics in arms reach. 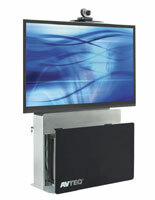 Audio visual trolleys may be purchased with locking cabinets to secure the valuable merchandise when not in use. These carts are commercial grade monitor brackets with wheels that will present many different flat screen television sizes. Monitor mounts have VESA bracketing to hold screens ranging from 32" all the way up to 80" wide. 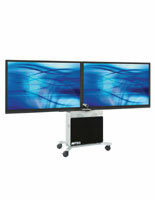 Some of the flat screen television brackets can even accommodate two monitors at one time to offer twice the content to viewing audiences. All of these carts come with at least four wheels for added convenience. 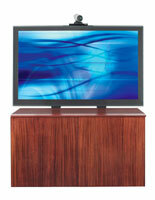 The casters include at least two locks to keep the television steady when giving a presentation. 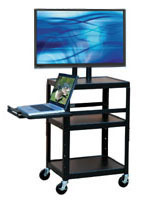 Portable carts can also be used as a workstation when preparing lectures for an upcoming class or symposium. 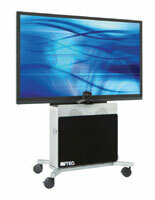 Increase interest and engage audiences by including the useful electronics displays with wheels. All of these commercial grade portable television and monitor displays are crafted out of high quality materials to withstand frequent use over a lengthy period. 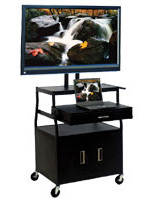 The steel and wood constructions with sturdy wheels will help presenters make great speeches for a long time. However, not all of the displays are exactly the same. Rolling stands feature varying numbers of shelves and storage space, including tiered, standard shelving and pull out shelves. 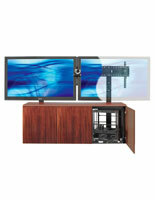 Different brackets and mounts are included depending upon the size of the flat screen television. Some of these VESA compatible brackets components are height adjustable to raise the monitor to the perfect height for viewing.